All garage doors rely on powerful springs to keep them moving. Garage doors typically utilize either torsion or extension springs – both of these types are kept under exceptional tension during the course of their working life. This relentless strain will eventually cause them to weaken. There are a few visual signs you can look out for. For example, if your door sags or wobbles as it moves, you should check the door’s balance. There is a straightforward procedure for testing whether the springs are supporting the door properly; simply open the door halfway and disconnect the opener. The door shouldn’t move considerably - if it does, the springs may not be properly tensioned. A slight weakening of your door springs can be solved for by our technicians with a tension adjustment. However, a spring that’s significantly worn out will need to be replaced. If the spring is left to wear even more, there’s a strong likelihood that it will snap. This will drop the door, allowing it to close on anything that’s beneath it - when a typical door weighs 150 pounds, that’s not good. When Do Springs Wear Out? Like all components in your door system, springs will wear out at varying rates. A high-quality spring that’s regularly cleaned and lubricated can last longer than 10 years, while cheap springs might fail after just 3. This uncertainty makes it all the more important to keep a close eye on your door and to regularly test its balance. There are some DIY tasks that homeowners can easily carry out. This is a dangerous task if you haven’t been thoroughly trained for it; we strongly recommend that you contact our team for assistance. If you think your door springs might be starting to weaken, it’s important that you get in touch with our team. 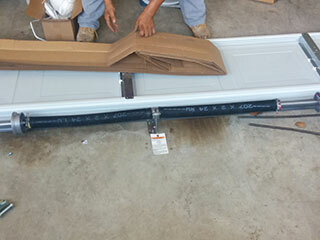 Contact Garage Door Repair Northport to schedule an appointment.